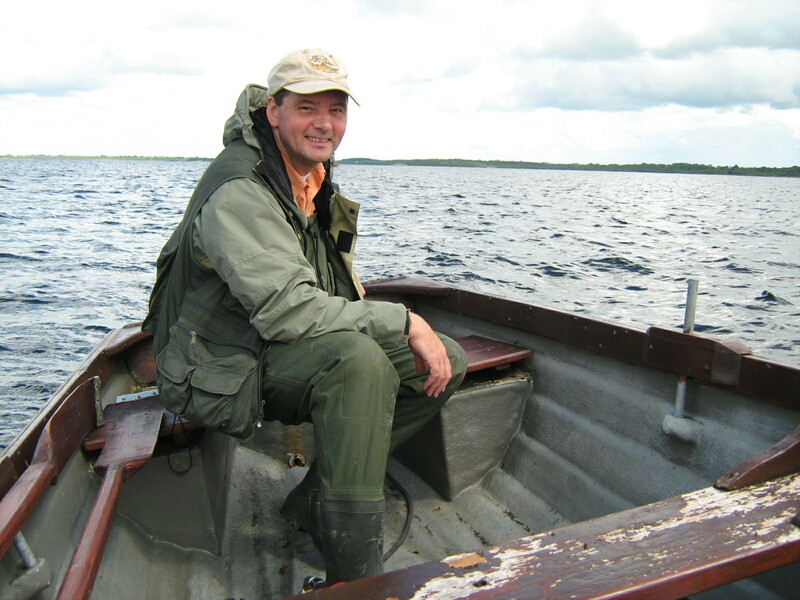 That’s me in the photo, motoring along on Lough Mask. Looking at the photo you can see that my boat could use a lick of varnish, but there is no mad panic about that yet. Those waders look a bit dodgy too, but nothing a few patches won’t sort out. Of much more importance is the nice ripple on the lough, just grand for the wet fly. From this you will have gathered that I am not a tackle tart who invests huge sums in the latest hi-tech angling equipment. I try to maintain my gear so it lasts as long as possible and view the tackle industry through a jaundiced eye – it looks like a marketing managers dream and we anglers are the suckers who rush to buy the latest new-fangled gadgets! I live in Co. Mayo and this blog is where I write down my thoughts, ideas and experiences of the angling in these parts. 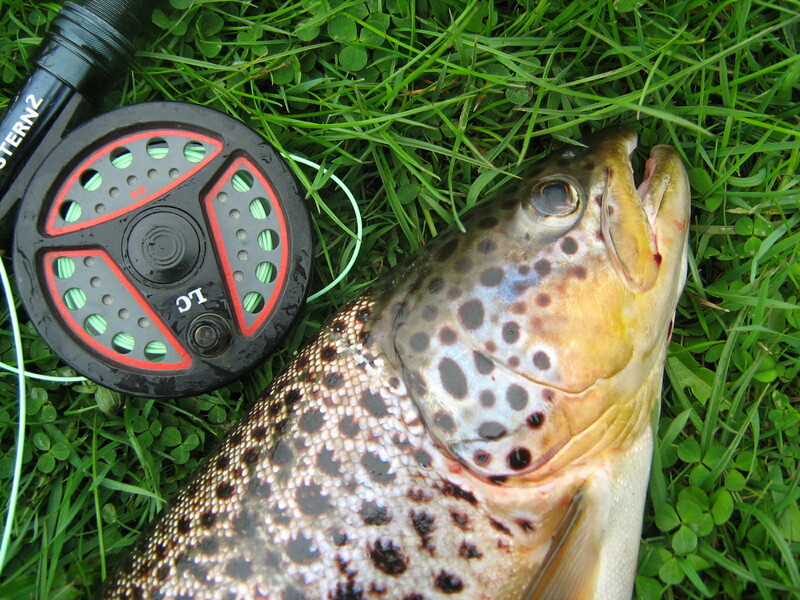 Fishing in Ireland is much more than just going out with a rod and catching a few fish. The challenges are great and the results sometimes leave a lot to be desired but the ‘craik’ is a huge part of the the whole angling scene. In modern Irish culture ‘the craik’ is good enough reason to do just about anything and fishing is an extension of that devil-may-care attitude to life which goes a long way to defining the Irish. A days fishing is often rounded off with a pint of porter in one of the local pubs and the details of the day discussed in great detail by all present. Now a confession – I am not Irish. I am in fact ‘a blow in’, born a raised in Aberdeen, Scotland. The locals put up with me because I have been hanging around this neck of the woods for many years now. My fishing apprenticeship was on the rivers Dee, Don and Ythan in Aberdeenshire in the company of some excellent fishermen, many of whom are sadly no longer with us. In those far off days salmon and sea trout were present in good numbers and big baskets were not uncommon. I vividly recall my mother groaning ‘not another salmon!’ as I came through the front door with a fresh springer. In addition to the actual angling I also tie a few flies so look out for patterns and tales of the ones which worked and the ones which didn’t (many more of the latter than the former I am afraid). I fish with a small number of friends or simply wander off on my own with rod and line. At my age (knocking on for 60) and physical limitations (plagued with arthritis in my feet and ankles) I have to leave the more adventurous fishing venues to the younger lads and I dearly miss scrambling down to distant rock marks or deep wading fast rivers. For me, a day on the lough in a boat or messing around on a spate river chasing grilse is about my stretch. I fish all over Mayo and rather than specialising in any one method or concentrating on one target species I cast a line for anything. You will see fly fishing, trolling and beachcasting all cropping up here, with a sprinkling of boat fishing in the sea, depending on the time of year and my general inclination at the time. I will post as and when I have something which I think may be of interest to others, which is basically my way of saying when I can be bothered. If I don’t post for a while that will probably indicate that work is getting in the way of my fishing. Please feel free to get in contact, I like to think I am approachable and tend towards helpfulness as a rule. Enjoy! Glad your enjoying it David. Wish I was catching more fish to write about! OK, around that time we will have olives hatching and the very first of the mayfly will be hatching if the weather is kind. 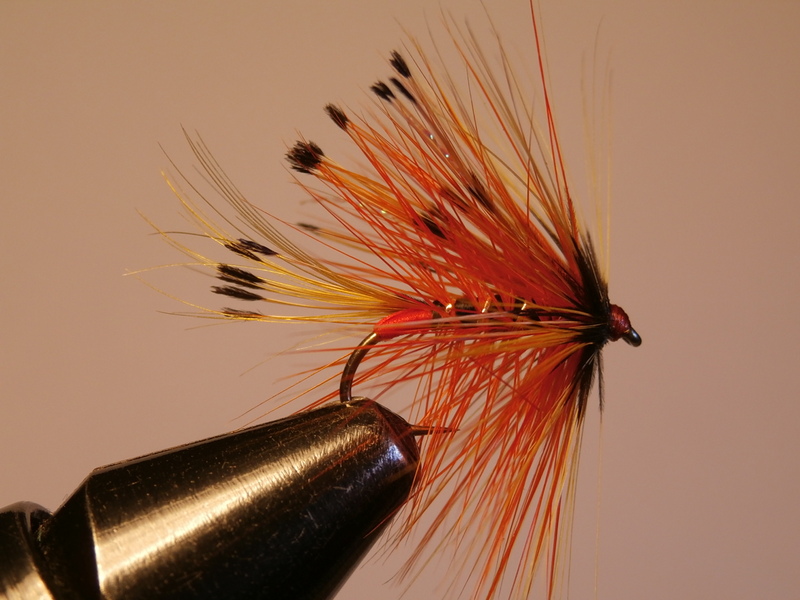 The patterns you mention will all work but I would add a small (size 12) Connemara Black with an orange fl. tag. Adding a touch of Globrite no. 4 floss as a rib or a tag seems to make a difference to many patterns on Lough Conn. yellow and olive mayfly emergers do well if the mayfly is up. Anything claret on a dull/wet day. olives often cause difficulties. you can see fish rise they refuse everything you throw at them! When all else fails I fish a cast of size 12 wets with a Green Peter on the leader somewhere. Hi, i have also been “Blown In” from Scotland, Stirlingshire. I have started doing a lot of sea trout fishing around the Belmullet area. I just started last season and have had a good few trout this season. If your ever down this way, would be good to meet up and cast a few rods together?? Hi there Wul, sounds like a plan! I get down to Belmullet quite often so I will give you some warning of the next time I’m heading there. Hi Peter, there are a few weel kent faces in that old photo from the Mugiemoss social club! You are right, Davie McKay is there along with Ally Skinner, George Gauld, Brian Ord, Stanley Angus etc. Great days and some brilliant fishing. Leeda LC reel! Love it. Very underappreciated, durable and functional piece of kit. I’m with you on the LC Alistair, an excellent reel for the money back in the day. I still use an 80 and a 100. Very interesting reading about your “apprenticeship” on the Ythan. I used to fish the estuary with my pal Tommy who lives near Parkhill. I still have an ample supply of Sutherland Specials and was lucky enough to catch some decent sea-trout there. Now, sadly, the fishery is being run in a way of which I disapprove and Tommy and I never go back. Nowadays I fish in South Uist where the Kate Maclaren muddler and Claret Bumble usually feature on my cast for sea-trout. I tie all my own flies too, and for a while now I have been unsettled by the usual dressing for the Goat’s Toe. I noticed one day how much the peacock ilen feather hackle “collapsed” in the water and thought that it could not be playing properly. I have decided to tie some more using blue sparkle organza as an under-hackle to support the peacock. No idea whether this will work but I would be interested to read your thoughts. I am writing this here in Edinburgh at 5.45 a.m. having been wakened by the storm which is raging round the house, so I am off back to bed now to dream of days ahead on Fada and Roag! In conclusion, may I say how much I concur with your “make-do and mend” attitude. It’s fishing after all, not rocket science! Tight lines, and keep showing us your dabblers, please. Hi Donald, The same storm battered the West of Ireland yesterday. I heard about the changes at Newburgh and like you am disappointed in the changes for the worse there. I have not tried organza but there is no reason it would not work. I’m convinced a mudddler head improves the Goat’s Toe! Never managed to get over to South Uist, it looks fantastic. I fished in Orkney a few times and loved the trout fishing there and imagine Uist would have a similar feel to it. Thanks for taking the time to write, sometimes I wonder if I’m mad to keep posting on the blog so it is nice to know there are other like-minded anglers who read and enjoy my ramblings. Look out for more Dabbler patterns coming soon. Hi Mark, I am sure you will enjoy Carrowmore, it is a very special place to fish. Watch where the regulars and locals are fishing and use small flies, you won’t g far wrong that way. Thanks for putting so much effort into your blog.I have just spent the last few hours reading through it and found it a most enjoyable way to nurse a post Paddy’s day hangover.I fished the Robe while on holidays about 6 years ago around the crossboyne area with varying degrees of success although it was an enjoyable few hours.I’ll be in enniscrone for a week in mid April and I think a trip to the Robe will be on the cards after reading about here.Have you ever fished for sea trout at the end of Enniscrone beach?.I am thinking about maybe giving that a lash with the spinning rod also.Thanks again and keep up the good work. Hi Ritchie, glad you are enjoying the blog. Some days it is a joy to write and the words come easy and flow in to the page, then other days it is little short if torture to scribble even a few lines. It’s nice to know others are getting enjoyment from my posts. Afraid I have not fiched the pier at Enniscrone but I have heard tales if sea trout being caught there on smallish silver spinners. The lads on the Killala side if the bay swear by natural sandeels so it might be worth acquiring some if them for your trip. Let me know how you get on. I read your recent blog where you commented on how poor Lough Conn was last year. I have to agree I find it has really changed in the past 4 or 5 years. There seems to be an awful lot of very small fish and only the rare 12 inch fish. The water is much clearer than in the past and the place seems to be packed with roach. It would be good to hear other people’s experiences. I have been fishing Conn for over 40 years and this past 4 or 5 years have presented the most difficult and challenging fishing I’ve ever experienced. The last few sesons have been exceedingly poor on Conn and Cullin but I ws speaking to a local angler last week and he had good fishing with 14 in the boat to two rods the previous weekend. That is more than I caught all season last year! Maybe there is a glimmer of hope that this year will see a return to better fishing on these loughs. I enjoyed your article about the kynochs killer,I moulded these from the original mould up until I left the factory about years ago.I can assure you the mould is still going,but in very small numbers!. I have always been interested in the story of the Kynoch and the twists and turns in the tale of who owned the rights to make them. I presume they were injection moulded? Hi. I am enjoying your blog. I’m staying in Mayo and have been fishing the Robe with my teenage son. It’s been quite murky and no bites so far but we are enjoying ourselves. If you have any comments they would be welcomed. Hi Andrew, great to hear you and your son are trying the river Robe. it should begin to fish anytime now so stick at it! There are usually some trout to be caught in the Hollymount area at this time of the season. I have been busy chasing salmon on the Moy but will try to get out to the Robe over the coming weekend. might bump into you then. Sorry didn’t get to finish the message. We take the ferry on Saturday but we will be back maybe in the summer. Wednesday tomorrow we are being taken out on lough mask if our guide is ok he wasn’t well today. My son tried hollymount yesterday.